Both the Roof and Norway rats are guilty of transmitting a number of diseases. Description. A blackish (or brownish), medium-sized, slender rat with long, naked, scaly tail; tail usually longer than head and body but not always so. External measurements average: total length, 14.5 inches; tail, 7.5 inches; hind foot, 1.4 inches; weight, up to 1/2 pound. Distribution in Texas. Common over most of Texas, especially in towns. Habits. Roof rats are largely commensals and live in close association with man. They seldom become established as feral animals as do the Norway rats; however, in Lavaca County they have been found throughout the county, in the towns, and on the farms. They inhabited grocery and drug stores, warehouses, feed stores, and poultry houses and were very common in cotton gins and associated grain warehouses. On the farms they lived in barns and corncribs. They may live near the ground, but usually they frequent the attics, rafters, and crossbeams of the buildings. They make typical runways along pipes, beams or wires, up and down the studding, or along the horizontal ceiling joists, often leaving a dark-colored layer of grease and dirt to mark their travelways. Like the Norway rat, the roof rat is largely nocturnal and only where populations are relatively high does one see them frequently in the daytime. There is some indication that the larger and more aggressive Norway rat is supplanting the roof rat in many parts of the United States. In the southern United States, however, the roof rat is by far the more common of the two. They accept a wide variety of food items, including grains, meats, and almost any item that has nutritive value. Roof rats breed throughout the year, with two peaks of production — in February and March and again in May and June. The period of least activity is in July and August. The gestation period is approximately 21 days, and the number of young per litter averages almost seven. The young rats at birth are naked, blind, and nearly helpless. They mature rather rapidly, are weaned when about 3 weeks old, and are able to reproduce when approximately 3 months old. In Texas, young females with a head and body length of 125 mm were sexually mature. 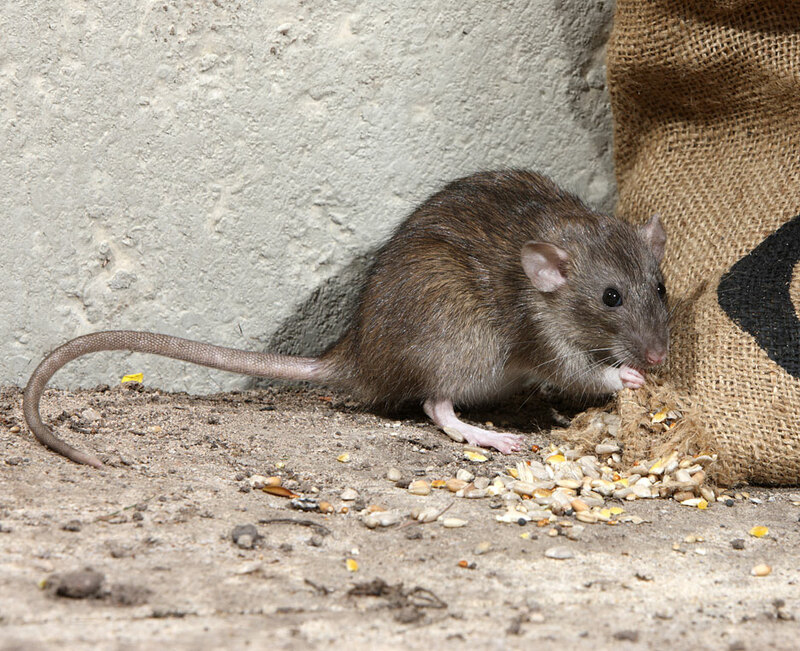 Like the Norway rat, the roof rat is destructive to property and foodstuffs. Also, it plays an important part in the transmission of such human diseases as endemic typhus, ratbite fever, and bubonic plague. Description. Similar to the roof rat but larger and chunkier; tail shorter than length of head and body. External measurements average: total length, 17.3 inches; tail, 8 inches; hind foot, 1.8 inches; weight, .9 to 1 pound. Distribution in Texas. Widespread in Texas but not so common in the southern half of the state as the roof rat. Habits. The Norway, or brown, rat lives both as a commensal in close association with man and in the feral state, chiefly where vegetation is tall and rank and affords adequate protection. For example, the marshy lands on Galveston Island off the coast of Texas offer ideal habitat for them. As a commensal this rat lives principally in basements, on the ground floor, or in burrows under sidewalks or outbuildings. They appear to be most common about feed stores, chicken houses, and garbage dumps. Although more at home on the ground, these rats are adept at climbing and have been observed traveling along telephone wires from one building to another. In places they become exceedingly numerous and destructive. They feed on a variety of items including both plant and animal materials. All sorts of garbage appear to be welcome, but their main stay is plant material. Grains of various sorts are highly prized. When established around poultry houses, they feed extensively on eggs and young chickens. They even have been known to kill lambs and young pigs! These rats are prolific breeders. The gestation period varies from 21 to 23 days and the number of young from two to 14, averaging seven or eight. At birth they are blind, naked, and helpless. They grow rapidly; their eyes open in 14-17 days and they are weaned when 3 or 4 weeks old. There is no delimited breeding season, but there is a tendency for a slow-up in reproduction during fall and winter. The life span is reported to be 2-3 years. Although these rats are preyed upon by a number of animals including the spotted skunk and the barn owl, as well as house cats, these predators often are not able to keep the rat population in check. Considerable destruction of property and foodstuffs can take place where rats are abundant. In addition, they constitute a menace to public health. They are known to be reservoirs of bubonic plague (transmitted to man by the bite of a flea or other insect), endemic typhus fever, ratbite fever, and a few other dreaded diseases. Because of this it is commonly said that Norway and roof rats are more dangerous than lions or tigers! Every effort should be made to exterminate them when they are found on your premises, and it is advisable to ratproof garbage cans and all buildings to prevent their entrance.